Head of equality Linda Roy welcomed delegates to the disability conference in Leicester last month by questioning the government and their “severe cuts” to welfare and disability benefits. Describing the impact on people with disabilities, Linda said “The most vulnerable in our society are being scapegoated and made to pay”. Referring to a recent report by the United Nations in which they raised ‘serious’ concerns about the disproportionate adverse impact the austerity measures have on disabled people, Linda raised concerns that “the United Nations report was so damning in its verdict that the UK’s austerity measures are in breach of the UK’s international human rights obligations”. Linda made a plea to conference that hardships and harassments in the workplace must be reported, “no-one should be forced to hide their disability because they feel they may be victimised or discriminated against, especially by an employer. If we find out that this is happening we will do something about it”. Linda went on to warn of “hard times ahead” for those with disabilities or from other disadvantaged groups. However, Linda reminded delegates that “tough times don’t always last, tough people do – especially when you have the support of your trade union”. 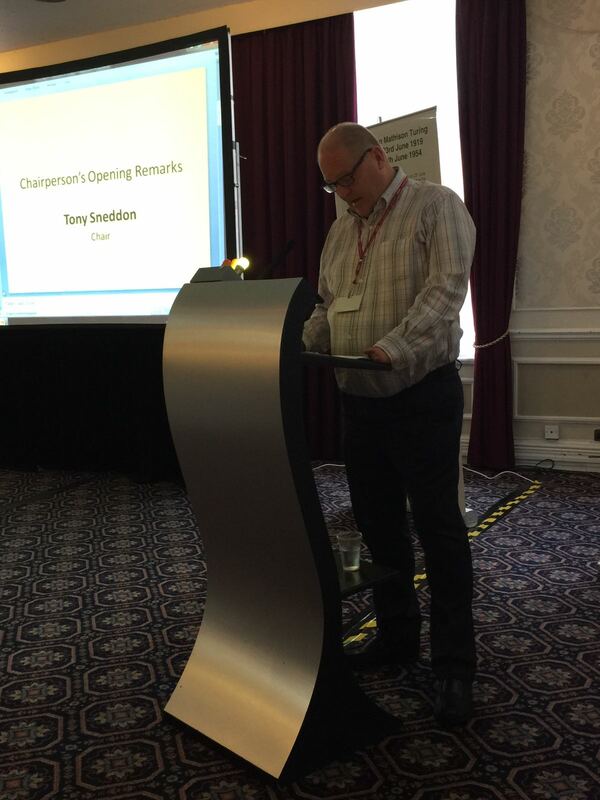 Chair of conference, Tony Sneddon, also took the opportunity to welcome delegates by saying, “we are here to discuss our special concerns and challenges, in a friendly environment amongst like-minded individuals to network, share ideas and challenge discrimination. Time and time again, statistics have proven that those living with disabilities are some of the most marginalised and disadvantaged social groups in society”. In a swipe at the government, Tony continued, “To win votes, the Tories used their manifesto to promise that those most vulnerable in society will receive the support they need to lead a fulfilling life. However, billions of pounds worth of cuts to benefits and social care has seen them hurt those who are in the most need of help”. 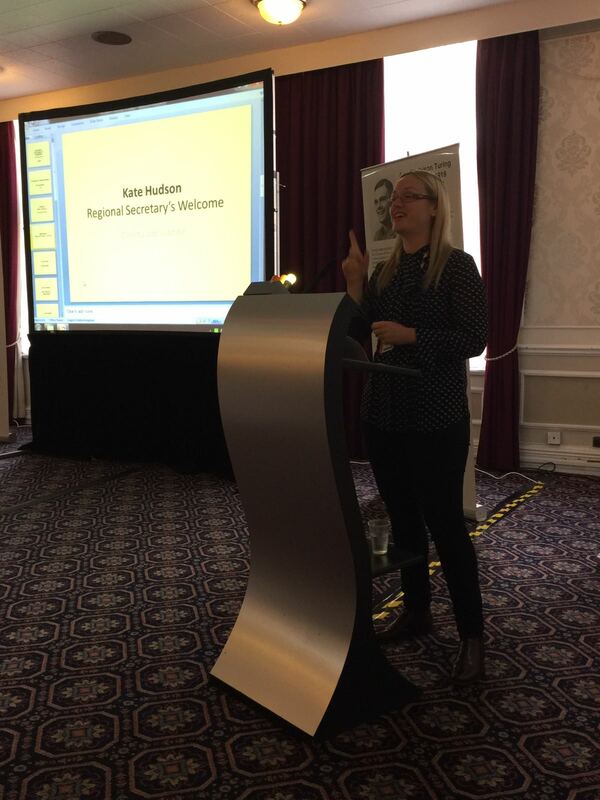 Midlands regional secretary Kate Hudson, in her opening address gave a passionate speech on the perception of disability by referencing one of Leicester’s most famous sons, Joseph Merrick. A man remembered mostly for his severe deformities and in literature as the Elephant man. He was given this cruel title whilst being exhibited in the 19th Century freak shows, touring around the UK and then Europe. Kate described his suffering and loneliness in detail and although acknowledging a vast improvement now on the perception of people with disabilities, Kate insisted “thankfully things have got better since the 19th century, but as we all know discrimination still exists. It is so important that we continue to come together, under the banner of equality, in the name of our union”. There were many motions discussed on both national and industrial issues throughout the day. One early, carried motion saw calls on the union amongst delegates to challenge Royal Mail Group over breaches to the National Agreement on the Ill Health policy and the correct implementation of the ‘Time To Talk Day’. These were not met due to incorrect implementation and it was debated that any future CWU Mental Health Awareness campaigns should be promoted across all strands of the union and be given a greater time scale in which to promote. Moving the motion, Martin Rawles, Plymouth and East Cornwall Amal branch equality officer stressed “we believe, in the majority of workplaces this is not being implemented. We believe, there are procedures we can put into place to support any CWU backed mental health campaigns”. Katy Hartland, Gloucester Amal branch rose to support the motion and said “we often feel that management dismiss these campaigns too easily and make things worse through harassment and dismissing those who pursue such initiatives as trouble makers”. Also in support wasSandy Best, South West NO 7 branch, “With mental health issues such as stress and anxiety being the biggest cause of sick absence, you would have thought that these campaigns would have been a priority”. Delegates also went on to pass a motion, calling for government action to implement the remaining provisions of the 2010 Equality Act. Implementing its final provisions would see people with disabilities having better access to transport, housing and would seek to end this type of discrimination. Terence Brady, Great Western Branch warned that “thousands of disabled people are still not being treated as equal citizens and rights many of us take for granted, are being denied to those of us with a disability”. Lee Starr-Elliot, Bristol and District Amal branch and first time speaker to conference, strongly supported the motion, “as a deaf person I regularly experience restrictions in accessing simple things such as attending sports events and visiting the cinema”. Other motions passed included the encouragement of disabled members into becoming Councillors and MPs and the introduction of a new one-day awareness course to be run in the field, on understanding disabilities for representatives. On the subject of encouraging members with a disability, speaking on behalf of the DAC, Tony Peddell insisted “this has to be achieved, it has to be right in a modern society, things have to change and we must make a difference”. In respect of the proposed one day awareness course, Merlin Reader, Mount Pleasant International branch told delegates “with the government cutting funds to training we must ensure that the CWU continues in some capacity its education and training programme”. Conference gave a standing ovation to special guest speakerPaul Maloney, with his family in attendance, who also told of his personal struggles with “this penny pinching government”. After listing many of the horrific injuries he had sustained including collapsed lung, a broken back and a bleed to the brain, Paul told conference that even after submitting his “extensive medical records” to Birmingham Council “they still turned down my blue badge”. Delegates also had the opportunity to meet and listen to guest speakerCharlie Balch who made a powerful and emotional contribution on the subject of depression and suicide. The father of four has been suffering from depression his whole life and continues with this struggle today. Charlie told the audience how just three years ago he had found himself waking up in a hospital bed with two broken ribs after police officers had to resuscitate him after he had taken an overdose. Charlie had kept his plight and his suicide attempt to himself as many who suffer from depression unfortunately do. However, following the tragic news that two young men had committed suicide in his home town, he decided it was time to tell his story. 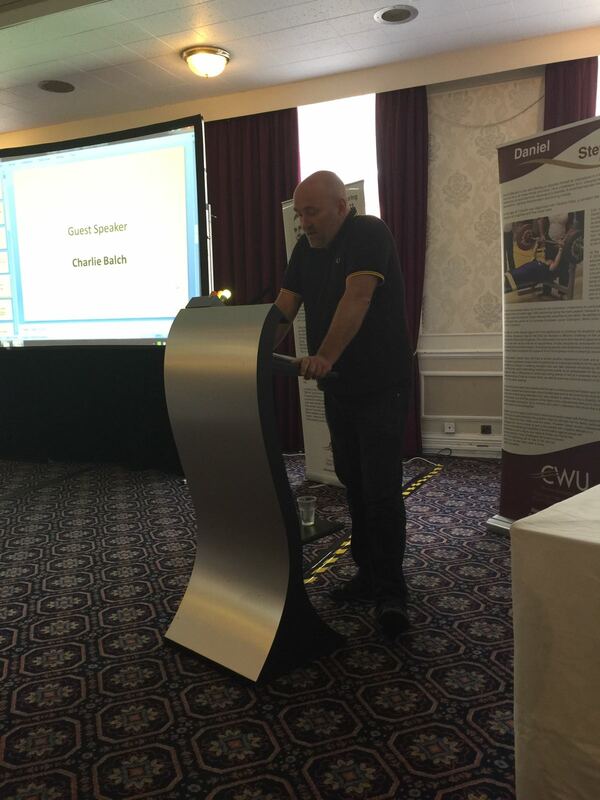 Charlie urged conference “the aim of this is to get people talking about mental health”. Charlie explained to conference with great courage, how he has a tattoo on his wrist of a semi-colon and rather emotionally explained “the semi-colon symbolises the continuation of a story. Every time I see it, I am reminded that the story is not over yet”. 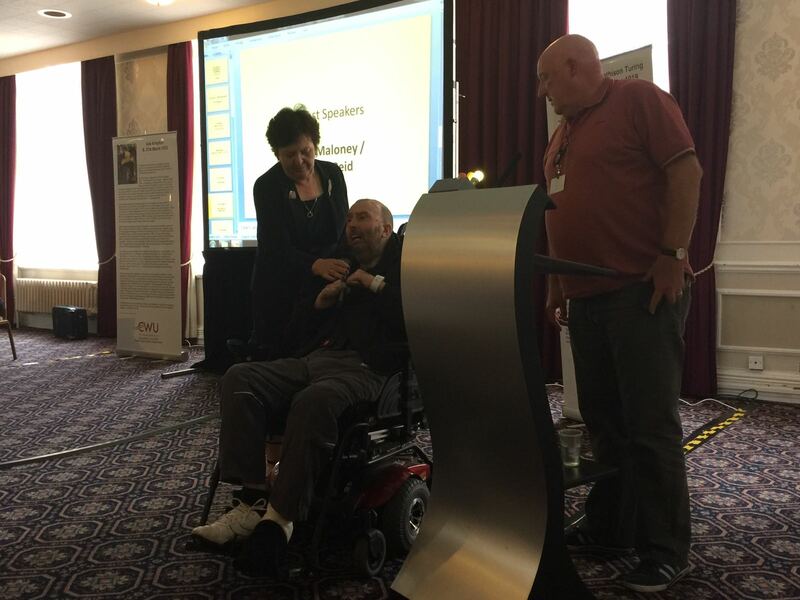 Conference were able to draw on the strength of testimony from each of the special guests throughout the day and guest speaker Lee Barron – the midlands regional secretary for the TUC – presented the delegates with a short video of another heartfelt account of personal struggle. The video was of a GMB member named Jacci Woodcock who had been diagnosed with terminal breast cancer and had then encountered problems at work after making them aware of it. The TUC have launched a voluntary charter, which they hope to get enshrined in law, called ‘Dying to work’, to protect workers who are diagnosed with a terminal illness from dismissal from work. In Jacci’s case she had first become aware of the lack of job security when she began feeling tired with her illness in the workplace and submitted a ‘sick note’ to her employer. This is when the human resources department of her employer came to visit her and were asking what Jacci considered “the wrong questions”. “I had expected them to come and see me and be supportive, instead they were asking how long I was able to continue to work and how the illness would reflect on the company. I was angry so I went to my union, the GMB who discovered that there is no law to protect terminally ill workers”. The campaign began to take shape and was taken to the TUC, who took charge and are now seeking legislative change in parliament. For now, they have started a voluntary charter, which many companies both large and small have begun to implement, most recently of which Santander, whom became the first bank to support the initiative. Lee explained “we are there to make sure that we give workers a voice. If we do not support and initiate a campaign such as this, then no one else will. We are seeking a protected characteristic, for those workers who are pronounced terminally ill. It is about a choice to decide if they want to continue working or not”. Lee also praised the work that the CWU continues to do in making this campaign known and urged pressure on other businesses in which the CWU has recognition such as BT and Royal Mail.